Uranus, named after the the father of the Roman god Saturn, is the seventh planet in the Solar System and third of the gas giants. It is the third largest planet by diameter, yet fourth most massive. William Herschel discovered Uranus in 1781. The planet is too dim to have been seen by ancient civilizations. Herschel himself believed that Uranus was a comet at first, but several years later it was confirmed as a planet – making Uranus the first planet discovered in modern history. The original name proposed by Herschel was “Georgian Sidus” after King George III but the scientific community didn’t take to it. Instead, Uranus was proposed and accepted by astronomer Johann Bode and it comes from ancient Greek god Ouranos. Uranus rotates on its axis once every 17 hours and 14 minutes. Like Venus, it turns in a retrograde direction which is opposite to the direction Earth and the other six planets turn. It takes Uranus 84 Earth days to orbit the Sun. Its axis is at 98 degrees, which means it almost lies sideways as it orbits the Sun. This means that the north and south poles of Uranus lie near where the equator is on Earth. During parts of its orbit one or other of the poles directly face the Sun which means the planet gets around 42 years of direct sunlight followed by 42 years of darkness. A collision may have caused the unusual tilt of Uranus. The theory is that an Earth-sized planet may have collided with Uranus which forced its axis to drastically shift. Uranus wind speeds can reach up to 900 km per hour. This is roughly 560 miles per hour. The mass of Uranus is about 14.5 times the mass of Earth, making it the lightest of the four gas giants of the outer solar system. Uranus is often referred to as the “ice giant”. While it has a hydrogen and helium upper layer like the other gas giants, Uranus also has an icy mantle which surrounds its rock and iron core. 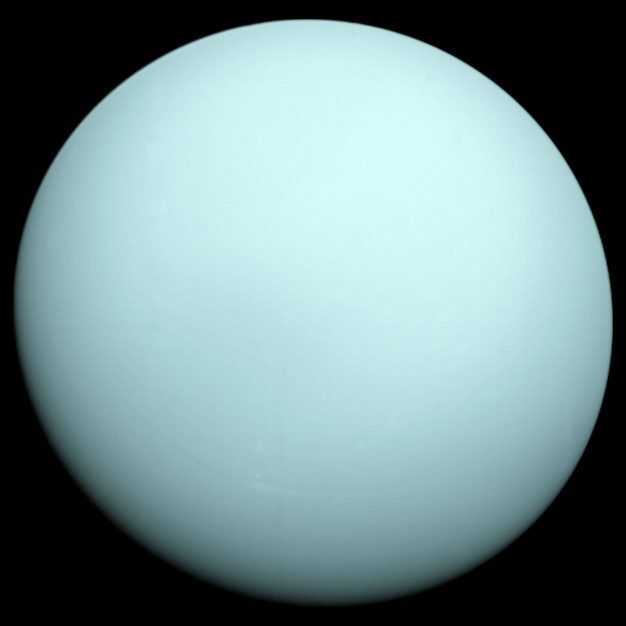 The upper atmosphere of water, ammonia and methane ice crystals gives Uranus its distinctive pale blue color. Uranus is the second least dense planet in the solar system, after Saturn. The Voyager 2 is the only spacecraft to have flown by Uranus. This happened in 1986 and it flew past the planet at a distance of around 81,500 km. This mission returned the very first close-up images of the planet, its ring system and its orbiting moons. The chemical element Uranium, discovered in 1789, was named after the newly discovered planet Uranus. Uranus is the coldest planet in the solar system. The minimum surface temperature on Uranus is -224°C – making it the coldest of the eight planets. Its upper atmosphere is covered with a haze made mostly of methane which hides the storms taking place in its cloud decks. The Uranian moons are named for characters created by Alexander Pope and William Shakespeare. For example, Oberan, Titania and Miranda. All these worlds are frozen with dark surfaces and some are a mixture of ice and rock. Of the Uranian moons, the most interesting is Miranda which has ice canyons, terraces and many strange looking surface area. Uranus has the distinction of being the first planet discovered in modern history. Actually, its discovery as a planet almost did not happen. In 1781, the astronomer William Herschel was charting the stars found in the Gemini constellation when he observed a disk-like object. His initial conclusion was that he had discovered a comet and reported his findings as such to the Royal Society of England. However, Herschel was puzzled when he calculated the object’s orbit. Instead of the more elliptical path occurring with comets, he found that it was much more circular. This observation, which was confirmed by other astronomers at the time, led Herschel to conclude that he had, in fact, discovered a new planet. Shortly thereafter, it was widely accepted that Herschel had discovered an unknown planet. As a result of his discovery, Herschel was given the privilege of naming the new planet. The name he chose was Georgium Sidus, which is latin for Georgian Planet. He opted for this name to honor then king of England, George III. This name, however, was not widely accepted, and as a result others began to suggest names. The name Uranus was put forth in the tradition of naming planets after deities in Roman mythology. Over time the scientific community accepted this as the planet’s name. At present, the only planetary mission to visit Uranus is Voyager 2. This lone encounter, which occurred in 1986, provided a large amount of data and discoveries. The spacecraft took thousands of pictures of Uranus and its moons and rings. Although the images of the planet showed little other than the uniform blue-green color seen from Earth-based telescopes, other images revealed the presence of ten previously unknown moons and two new rings. At this time, no future missions are scheduled for Uranus. Due to its stark blue appearance, the Uranian atmospheric patterns have been much more difficult to observe than, say, those of Jupiter or even Saturn. Fortunately, the Hubble Space Telescope has provided much more insight into the structural nature of Uranus’ atmosphere. Through more advanced imaging technologies than Earth-based telescopes or Voyager 2, Hubble has shown that there are latitudinal bands much like those found on the other gas giants. Additionally, the winds associated with these bands can blow in excess of 576 km/hr. The reason behind the monotonous atmospheric appearance is the composition of the top-most layer of the atmosphere. The visible cloud layers are composed primarily of methane, which absorbs those visible wavelengths corresponding to the color red. Thus, the reflected wavelengths are those of blue and green. Beneath this outer methane layer, the atmosphere is composed of roughly 83% hydrogen (H2) and 15% helium with trace amounts of methane and acetylene. This composition is similar to that of the other gas giants. Uranus’ atmosphere is drastically different in another regard, though. Whereas Jupiter and Saturn’s atmospheres are primarily gaseous, Uranus’ contains much more ice. This indicates that the Uranian atmosphere is extremely cold. In fact, at approximately -224° C, its atmosphere is the coldest found in the Solar System. What is even more interesting is data indicates that this extreme temperature is constant globally, occurring even on the side that is not sunlit. Uranus’ interior is thought to consist of two layers: a core and mantle. Current models suggest that the core is primarily composed of rock and ice and is approximately .55 times the mass of the Earth. The planet’s mantle is believed to be 8.01 x 1024 kg, or about 13.4 times the mass of the Earth. Furthermore, the mantle is composed of water, ammonia and other volatile elements. What distinguishes Uranus’ mantle from those of Jupiter and Saturn is that it is icy, though not in the traditional sense. Instead, the ice is very hot and thick. The mantle is 5,111 km thick. What is most surprising about Uranus’ interior and one of the most distinguishing features with respect to the other gas giants is that it does not emit more energy than it receives from the Sun. Considering that even Neptune, which is very similar in size to Uranus, produces approximately 2.6 times the amount of heat that it receives from the Sun, scientists are very intrigued by the low heat that Uranus generates. There are two popular theories for this phenomenon. The first says that Uranus was struck by a large body, dispersing into space most of the heat that planets normally retain from their formations. The second theory claims that there is some barrier preventing the internal heat from making its way to the planet’s surface. When Uranus was discovered it expanded the radius of the known Solar System by almost a factor of two. What this means is that, on average, Uranus’ orbit is about 2.87 x 109 km. The consequence of such an enormous distance is that it takes sunlight around two hours and forty minutes to reach Uranus&#8212that is almost twenty times as long as it takes sunlight to reach the Earth! This huge distance also means that a year on Uranus lasts almost 84 Earth years! At 0.0473, Uranus’ orbital eccentricity is just slightly less than that of Jupiter’s .0484, making it the fourth most circular orbit of all the planets. The result of Uranus’ fairly small orbital eccentricity is that the difference between its perihelion of 2.74 x 109 km and aphelion of 3.01 x 109 km is just 2.71 x 108 km. Perhaps the most interesting thing about Uranus is how odd its rotation is compared to all of the other planets’. The axis of rotation for every planet other than Uranus is roughly perpendicular with their orbital plane. However, Uranus’ axis is tilted almost 98°, which effectively means that Uranus rotates on its side. The result of this is that Uranus’ north pole points at the Sun for half of its year, while the south pole points at the Sun the other half of its year! In other words, it is daytime on one Uranian hemispheres, while it is night time on the other for 42 Earth years at a time. Furthermore, due to this extreme rotation, Uranus does not have days like on other planets&#8212that is, the Sun doesn’t rise and set like on other planets. The cause for this highly unusual axial tilt is theorized to be the effect of a large body striking Uranus with such force that it essentially knocked the planet over on its side. Although Saturn’s rings have been well known for some time, it wasn’t until 1977 that the planetary rings surrounding Uranus were discovered. The reason behind this is twofold: their distance from the Earth and their low reflectivity of light. Nonetheless, the Voyager 2 spacecraft identified two more on its fly-by mission in 1986, followed by the Hubble Space Telescope discovery of two additional rings in 2005. The total number of known rings currently sits at thirteen, the largest and brightest of which is the epsilon ring. Uranus’ rings differ from those found around Saturn in both the size of its particles and the particles’ composition. First, the particles making up Saturn’s rings are small, with few larger than several meters in diameter, whereas Uranus’ rings contain many bodies up to twenty meters in diameter. Second, the particles of Saturn’s rings are largely composed of ice. Uranus’, however, are composed of both ice and considerable dust and debris.